How many times have you gone to your favorite bakery just to tuck into a delicious cheesecake and wished you could have the luxury of eating it at home as and when you please? I wouldn’t be surprised if you felt like that every single time you devour it. 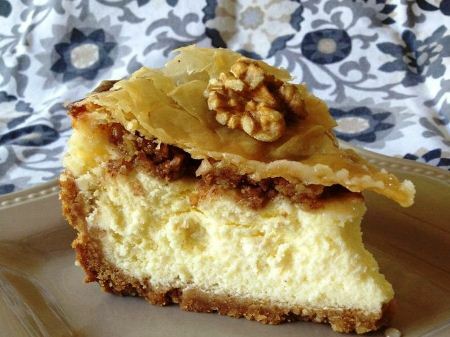 While cheesecakes are a regular feature on most bakery café menus and a majority of us love gorging on them, we’re often hesitant to make them at home. Yes, they are extremely delicate and one wrong move in the baking process can ruin them, but that should not give you the impression that baking cheesecakes is impossible. Here are a few tips for home-bakers to perfect the art of making the most delectable, bakery-style cheesecakes in their own kitchen. One of the main ingredients that go into a cheesecake is cream cheese. It can make all the difference to its appearance as well as the taste, so you need to make sure that you get this important element right. Good cream cheese can result in a soft and silky cheesecake. If you’re wondering what brand/type of cream cheese should be used, relax! Whether it is a local brand or a well-known one, either should hold you in good stead provided you ensure that they haven’t surpassed their date of expiration or have gone bad due to improper storing. For a rich, full-bodied and delicious cheesecake, make sure you buy full-fat cream cheese. Use only the best ingredients for a result that looks like a dream! While cream cheese is a crucial component of a cheesecake, it needs other quality ingredients as well to turn out tasting like a delight! Several recipes either use heavy cream or sour cream to add moisture and extend a soft texture to the cake. If you like your cheesecake with a hint of tanginess, you will do well to go with sour cream. Further, you will also need to add a few eggs to hold the cake together. Adding the required number of eggs (as per the recipe) should help you get there, but a lot of home-bakers add an extra yolk to the batter to achieve a more velvety texture. Don’t want your cheesecake to crack when it’s baking? Add a bit of cornstarch or flour in the batter! Doing so will make it easier for you to slice the cake neatly. However, it will also alter the texture of the cheesecake to a certain degree. While the eggs will result in a soft, creamy texture in the cake, the motive behind adding starch to the cheesecake batter is to make the cake more firm and stable. A combination of both these ingredients will give your cake the balance it needs to achieve the perfect texture. If you’re using starch in your cheesecake, you can skip this part. But for those who want to bake a smooth and creamy cake without adding starch, you may want to use a water bath. 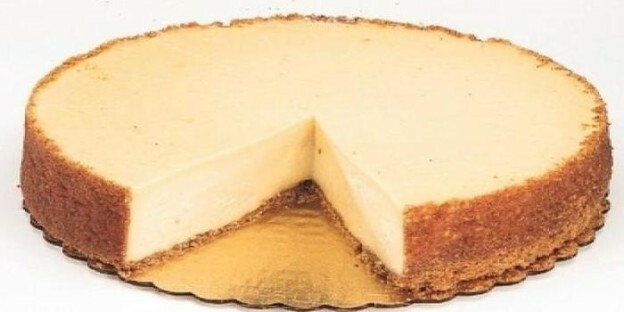 Doing so will enable you to bake your cheesecake in a gentle manner while simultaneously creating steam around the surface of the cake so that it doesn’t go dry. Wondering how this is done? Here’s how. • Cover the sides and the bottom of a spring form pan with aluminum foil. • Place the spring form pan (with the cheesecake batter) into a bigger, deeper baking pan with a little room to spare on all sides. • Add hot water into the larger pan (about halfway up) and place both the pans in a preheated oven. • Bake the cheesecake as mentioned in the recipe. Once it is baked, remove the spring form pan from the larger (or water bath) pan and set aside. Be very careful when handling these pans as they’re going to be extremely hot. • Once the cake has cooled down, put it in the refrigerator to chill completely. Remove the aluminum foil before slicing and/or serving it. To prevent your cheesecake from cracking, you first need to understand why it cracks in the first place. There are two reasons for this: overcooking and instant cooling. Both can be avoided with a little care. 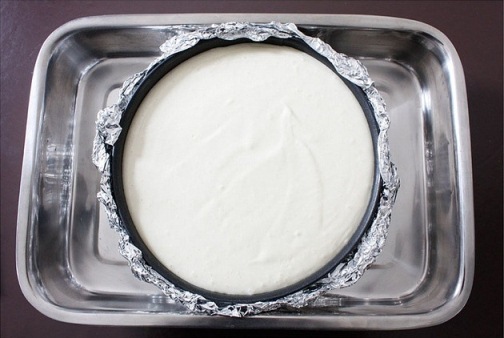 To prevent overcooking, bake your cheese cake until the outer ring is a tad puffed but firm. The inner ring should jiggle like jelly. If you see a few toasty golden spots on the surface, don’t panic. But if you see small cracks developing, start to cool down the cake immediately. When cooling the cheesecake, make sure you do it gradually. After turning off the oven, let the cheesecake rest inside with the door open for about an hour. Next, remove the pan from the water bath and let it cool completely. Run a knife around the edges of the cake to ensure it isn’t sticking to the pan as that may lead to the formation of cracks. A cheesecake is something that needs to be prepared in advance. You will do well in preparing it at least 4 hours (ideally overnight) prior to serving it. The process does not end with the careful baking and slow cooling, it also needs ample time to completely chill in the fridge before being sliced. I know it’s going to be hard to resist, but avoid cutting into a cheesecake before chilling it as doing so can leave you with disastrous results. It will have a thin custard-like texture, which is something you do not want. On the other hand, an adequately chilled cake will have a rich, creamy and satin-smooth texture that we all know and love. There is a method to getting a cheesecake right – a method that involves precision, consideration, and imagination. Using these three factors in tandem is sure to leave you with a cake that will stun and tease your taste buds, and make you feel like you’ve just had a slice of Heaven.